Barcelona faced Manchester United at Camp Nou in Quarter-final leg 2 of 2 football match of UEFA Champions League 2018-19, where Barcelona defeated Man United 3-0. 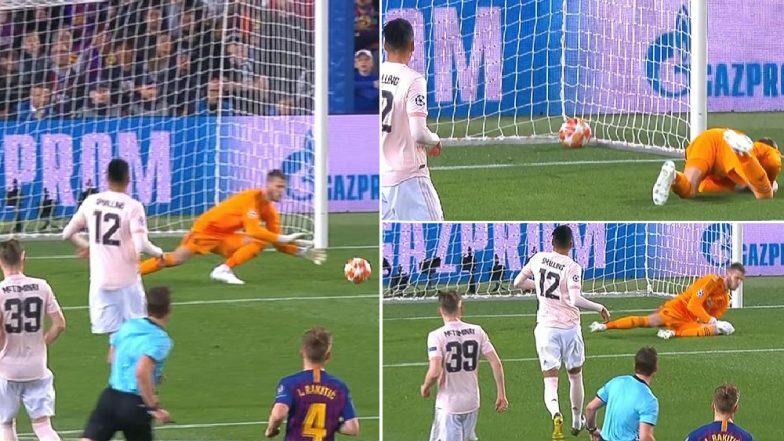 However, this match will go down in history as the goalkeeping mistake done by David de Gea in the first half for which he got trolled on social media. Barcelona vs Manchester United, Champions League Quarter-Final Live Streaming Online: How to Get UEFA CL 2018–19 Leg 2 of 2 Match Live Telecast on TV & Free Football Score Updates in Indian Time? Manchester United with this defeat now becomes the only team to exit Champions League tournament on seven occasions. Lionel Messi has scored a total of 45 goals in all games for Barcelona this season which is 10 more than any other player in the top five European leagues. FC Porto vs Liverpool, Champions League Quarter-Final Live Streaming Online: How to Get UEFA CL 2018–19 Leg 2 of 2 Match Live Telecast on TV & Free Football Score Updates in Indian Time?